For its fourth mission of 2019 — and the second this year with the Soyuz medium launcher from the Guiana Space Center (CSG) in French Guiana, Arianespace will be launching four more O3b satellites for SES. Operational since 2014, the O3b medium Earth orbit (MEO) satellite constellation delivers fiber-equivalent connectivity, and is part of SES’s bold vision of connecting people and empowering them with opportunities. Flight VS22 will be performed from the Soyuz Launch Complex (ELS) in Sinnamary, French Guiana. 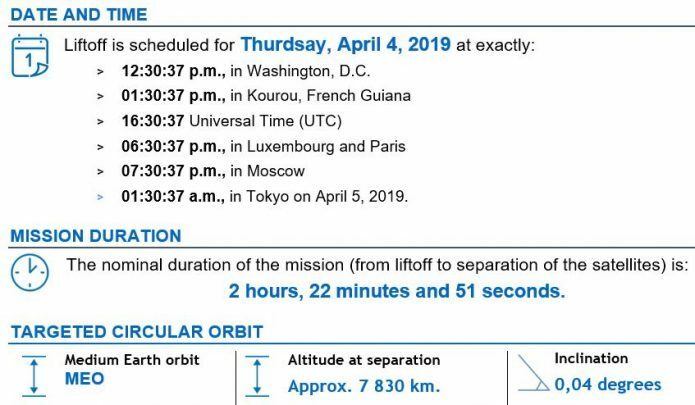 The Launch Readiness Review (LRR) will take place on Wednesday, April 3, 2019 in Kourou to authorize the start of operations for the final countdown. The O3b satellites lofted by Arianespace on Flight VS22 are the 58th, 59th, 60th and 61th satellites to be launched by Arianespace for the global satellite operator SES. SES is the world-leading satellite-enabled service operator and is the first to deliver a differentiated and scalable GEO-MEO offering worldwide, with more than 50 satellites in Geostationary Earth Orbit (GEO) and 16 in Medium Earth Orbit (MEO). SES provides a diverse range of customers with global video distribution and data connectivity services through two business units: SES Video and SES Networks which the portfolio includes O3b, the only non-geostationary system delivering fiber-like broadband services today. The four new Ka-band satellites will join SES’s existing constellation of O3b MEO satellites, orbiting at approximately 8,000 km. from Earth and serving customers based in almost 50 countries. They will improve connectivity capabilities, increase performance, and serve to seamlessly scale the existing O3b constellation. To watch a live, high-speed online transmission of the launch (including commentary in French and English from the launch site), go to arianespace.com or to youtube.com/arianespace on April 4, 2019, beginning 20 minutes before liftoff. Arianespace uses space to make life better on Earth by providing launch services for all types of satellites into all orbits. It has orbited more than 600 satellites since 1980, using its family of three launchers, Ariane, Soyuz and Vega, from launch sites in French Guiana (South America) and Baikonur, Kazakhstan.